So it's all been building to this. The Lady in the Van is our season finale before we take a Summer break. When our line up was announced I considered The Lady in the Van to be a bit of an odd choice, but having seen it I completely understood. 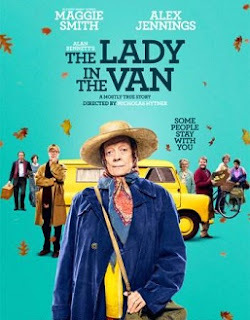 Watching The Lady in the Van for me felt like watching a vintage BBC comedy. It took me back to my childhood, watching witty Roy Clarke sitcoms with my family. I don't think I've ever seen a film that had quite that affect on me. This film was my introduction to the world of Alan Bennett. It truly does feel like you are sucked into his world, and I didn't want to leave. Alex Jennings portrays Alan Bennett as two versions of the man himself at odds with each other. "There is the self that does the writing and the self that does the living". These two versions of Bennett are highly entertaining while also highly critical of Bennett as a whole. In a film written by Alan Bennett, Alan Bennett doesn't exactly shine, and that is very much on purpose. The moments with the two bickering were some of my favourites of the film. They feel honest and relatable while still being humorous. Self depreciating rather than self aggrandising. If I had to criticise anything it would be that the curse words often felt forced and played for an unexpected laugh, which to me felt a little tame in this age. As the same actor is playing two identical roles there are some shots where keeping track of which is which becomes confusing, but it is a still a stellar performance from both Jennings, who had played Bennett previously on stage and had a grasp of his unique delivery and style already. These scenes are also impressive on a technical level, particularly a brief moment where one Bennett throws an object the the other catches it. This might not seem like much but as a filmmaker it left me baffled and wanting to know how it was done, like a magic trick. surprised to find myself moved by the subplot that is Miss Shepherds hatred of music, initially used as a comic device but later as a touching element to her character. The Lady in the Van is not the sort of film where any character goes through an arc. Nobody develops or changes in any way by design so such a subplot was needed to allow us to care about her a little more. The Lady in the Van is not an overtly emotional film, but one scene in the later act really changed my perception of the film and Dame Smiths character specifically. Given the nature of the character, Miss Shepherds eccentricity was always going to be a barrier but they found a clever way around that by humanising her gradually as the film progresses. That isn't to say that Maggie Smith's acting is at any point unbelievable, but the characters uniqueness could have easily gone the way of Baldrick from Blackadder, ridiculous yet sympathetic. Dame Smiths performance instead takes a more realistic approach, and its all the better for it. You always get the impression Miss Shepherd knows exactly what she is doing, like Edmund Blackadder himself, to stretch that comparison as far as it'll go. Speaking of humour, I can't decide whether The Lady in the Van is a funny film, an effective comedy, or not. That's for you to decide I suppose. Many times I laughed out loud but mainly at things that spoke to me personally. I know this from watching the trailer with others at our previous screenings and finding that the gags I loved were often met with silence, particularly a moment when Miss Shepherd is screeching while chasing young children who are singing in the street away as though they were birds on her washing line. I have seen this clip about a million times now, and the sound of her yelling still makes me laugh, but when I showed this to people not a peep. Similarly there were jokes in the trailer that passed me by while they killed with our Boychoir audience. That is perhaps my favourite thing about The Lady in the Van, it truly speaks to your own experience, relating to others differently. Bennett: Maybe you could come 'round and help with the decorating? Actor in Bennett's play: Sure. My girlfriends a dab hand with painting. Maybe I'm looking too much into this line, but maybe I'm not. I can't quite decide, but I found the line fascinating any many more lines will jump out at your own experiences. The films script is witty and scathing while at the same time engaging and charming. Few films I can think of ride the line between comedic and emotional so well, and that is high praise not just for the writing, but also for the relatable yet eccentric performances. As a boy brought up and raised on British sitcom humour, often based in pessimistic and relentless circumstances, this film excels while still keeping its emotional core in tact. See this film if you miss the glory days of British comedy, or yearn for a renaissance in British film. Both are well exemplified here.